Cut off stem ends of chili peppers and discard the stems. Split the chili peppers and soak in boiling water for 20-30 minutes. While the peppers are soaking, peel and roughly chop the peaches, onion and garlic. Drain the chili peppers and scrape the flesh from the skins with a butter knife. Discard the skins. Add everything to the food processor or blender and pulse a few times, until you get your preferred consistency (I like my sauce just a little chunky). Pour into a saucepan and cook until thickened. Pour into bottles or jars and refrigerate. 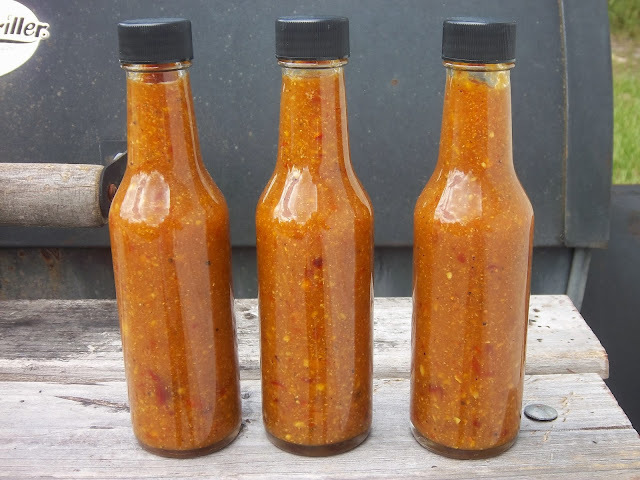 This sauce is great on a sandwich or as a glaze when you're grillin'!